I wish I could come home after picking up the kids from school and have time to cook a nice meal. I long for a calm, zen-like cooking experience each day, but instead I find myself chasing after my sons who prefer to run amok, trying to keep them from raiding the refrigerator and the pantry even though I fed them a snack as soon as we got home. We had to put locks on to keep the Three Amigos from eating us out of house and home. Yesterday’s meal was supposed to happen on Monday, but the events of the day and the constant distractions left me disorganized and frustrated at dinner time and I pulled out some leftover pasta sauce and boiled some spaghetti. Now there’s nothing wrong with that, and in fact spaghetti with tomato sauce and/or meatballs is Michael’s favorite meal, but I had a grilling recipe up my sleeve for Cinco de Mayo which I had to grudgingly postpone. I thought I could start some of the prep for dinner on Tuesday morning, but Monday night we remembered Top Gun, our three-year-old, had a project due for school the next day and I needed to finish some prep work on that before we could do it in the morning. So Tuesday morning was spent cutting photos and pasting them memory-book style onto a piece of paper describing his favorite things, and then we wrote our story about Spike’s visit (Spike is the class mascot, a stuffed kangaroo) and pasted more pictures onto that story. After dropping the boys off at school I did a little dance in my head thinking our toddler would go down for his afternoon nap and I could do all my prep work, but that was optimistic on my part. For the second day in a row he refused to take a nap and I ended up with a cranky toddler for the afternoon. I hope he doesn’t give up naps early like his oldest brother! Michael was late getting off work and the boys demanded my total attention for the rest of the day, so I finally tossed a burger and some dogs on the grill for them and saved the fish tacos for a quiet dinner just for the two of us after we got the Three Amigos to bed! We grilled in the dark, talking about our day and the refrigerator that isn’t working and debated whether to repair or replace. Mundane conversation, perhaps, but relaxing nonetheless, and it was time we had to ourselves. Michael said he loved the tacos and the salsa, and the cold beer with a lime wedge tasted pretty good after a busy day. P.S. Don’t forget about the Grilled Pizzas & Piadinas cookbook give away! Visit the original post to enter. The deadline is Sunday May 11 at 6 pm EST. 2. FISH: Stir together the spices and toss with the fish in the bowl or the zipper bag. Set aside. 3. SLAW: In the serving bowl, toss together the sliced cabbage and onions. Measure the cider vinegar in the measuring cup and add the sour cream and salt. Stir until thoroughly mixed, then pour over the cabbage and onions, and stir until the vegetables are evenly coated. 4. SALSA: In the serving bowl, toss together the mango, avocado, jalapeño, onion, and cilantro. Squeeze the limes over the bowl and stir gently. 5. GRILL: Pour the spiced fish into the lightly greased grill skillet/wok and cook over medium heat for about 5 to 7 minutes, stirring occasionally for even cooking. Fish should be slightly firm and opaque when finished. 6. SERVE: Layer your tacos in this order: Slaw, red peppers, fish, salsa, cheese. Enjoy with a cold Corona and lime. Looks great! Hands down my favorite taco dish. We’re shopping around for a new grill and nothing will be safe – I will grill it all! Goodness I do remember those days of great plans and the thrill of get something on the table fast. How wonderful though that you had the time for two, even if it was talking about the mundane. Somehow even those times are good too. Love the tacos . . . and the beer. 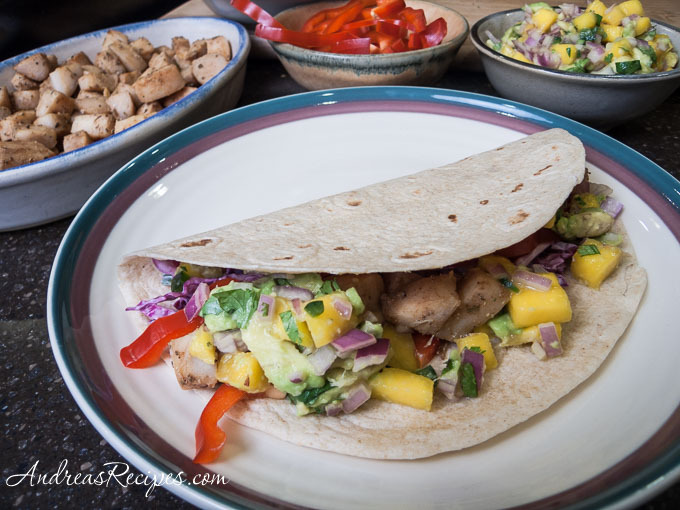 You are totally making my mouth water…fish tacos are my favorite!! I need to try this – thank you! vb – I know what you mean! Fish tacos are my favorite, too! MyKitcheninHalfCups – Every day is a new adventure with three little boys! Lisa – The best thing about these, besides the great taste, is they are good for you! Kimberly – Thanks, I hope you like them. Good to see you again!